ADaM E-Sign Our way to integrate electronic signatures. Thanks to recent legislation, electronic signatures are now legally binding throughout most of the world. Consider the costs of printing, processing and storing paper forms, and documents that require signatures. Now imagine that you can sign, and process these electronically from start to finish. How much time and money would you save? 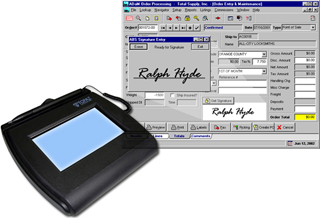 The enabling step is the integration of Interlink Electronics' ePad handwritten signature solution into ADaM for your electronic document processing. Now you can have electronic signature capture with ADaM E-Sign!